Store at -20 degree C. For extended storage, store at -20 or -80 degree C. Notes ? Repeated freezing and thawing is not recommended. Store working aliquots at 4 degree C for up to one week. Small volumes of CXCR1 recombinant protein vial(s) may occasionally become entrapped in the seal of the product vial during shipment and storage. If necessary, briefly centrifuge the vial on a tabletop centrifuge to dislodge any liquid in the container`s cap. Certain products may require to ship with dry ice and additional dry ice fee may apply. NCBI/Uniprot data below describe general gene information for CXCR1. It may not necessarily be applicable to this product. IL8RA: Receptor to interleukin-8, which is a powerful neutrophils chemotactic factor. Binding of IL-8 to the receptor causes activation of neutrophils. This response is mediated via a G-protein that activate a phosphatidylinositol-calcium second messenger system. 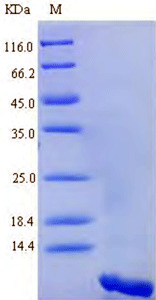 This receptor binds to IL-8 with a high affinity and to MGSA (GRO) with a low affinity. Belongs to the G-protein coupled receptor 1 family. 1. The proportions of IL-18Ralpha-expressing T lymphocytes and CD8(+) T lymphocytes were significantly higher in stable COPD patients than in nonsmokers and current smokers.